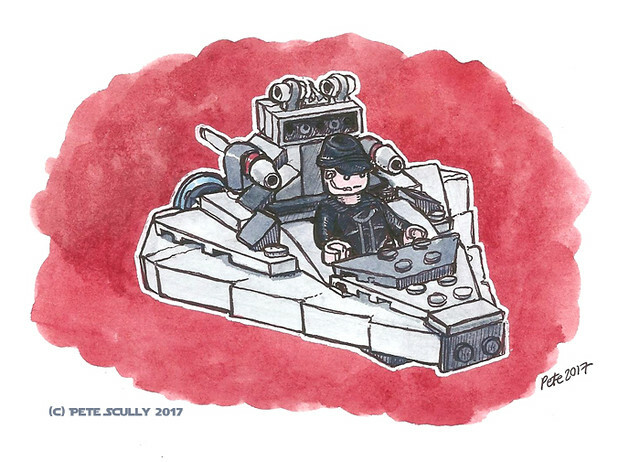 Since the year turned into 2017 I have done a lot of drawing, but most of it has been of Star Wars Lego. I love Star Wars, I love Lego. We have a lot of it around the house. Now you saw my aT-AT recently, well above is the Snowspeeder. 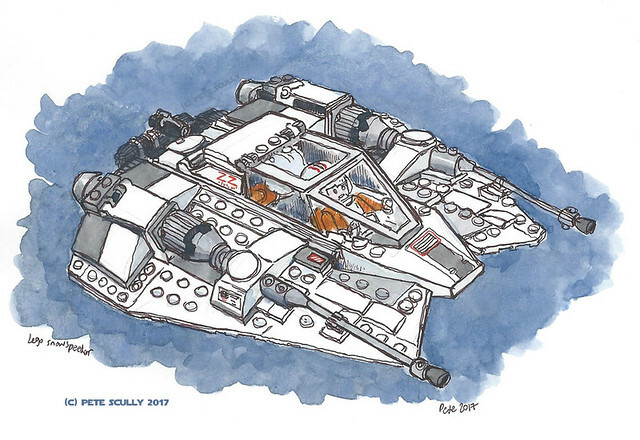 I love the AT-AT, I love the Falcon, but I always had a very special for the Snowspeeder. It’s the shape; I remember holding it as a kid, flying it around the legs of the Imperial Walker in the snow. More even than the X-Wing, it’s my favourite small flying fighter. I can draw Lego that faces in a different direction, you know. The two above though are “micro-fighters”, a very very small Star Destroyer and a TIE-Interceptor. The Lego micro-fighters are fun little mini-versions of starships and vehicles, easy to build and easy to play with. The TIE-Interceptor was a version of the TIE-Fighter that appeared in Return of the JEdi. There usually has to be a new type of TIE in every Star wars film (except the prequels, which were set in the pre-TIE-era). Here though are a couple of bigger Lego ships which in their way were predecessors of the TIEs (the window specifically, and the little wings, plus the pilot of the yellow one was a famous TIE-Fighter pilot in his own right. I give you Anakin Skywalker, who would (spoiler alert) become Darth Vader, flying in his favourite yellow, and his mentor and friend, Obi-Wan Kenobi in the red. These were seen in the opening to Revenge of the Sith, that long single shot through the battle above Coruscant. 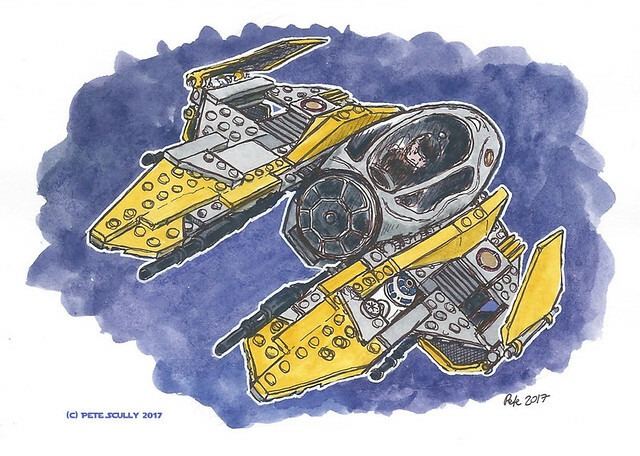 I love the Jedi starfighters from ‘Sith’, better than the triangular paper-airplane ships from ‘Clones’. The cockpits actually look like a hybrid of the B-Wing and the Tie-Fighter. I think though that the shape is slightly reminiscent of the Snowspeeder, when you are holding it, flying it around. I was gutted when these got trashed (spoiler alert) in the hold of Grievous’s ship (though Obi-Wan did get another one in blue and Anakin/Vader flew a green one to Mustafar, for some reason. I guess he didn’t have time to paint it Imperial Grey what with murdering all the Jedi and the Younglings, spoiler alert. Think about that though, Anakin/Vader’s gone down to the part of the Jedi Temple where all the starships are kept, and he chooses a green one? He’s killed all the Jedi, nobody is going to be hogging all the other colours, and of all the ones left he chooses green? Is Anakin/Vader trying to tell us something with that choice? Note how the Emperor left that one on on Mustafar; maybe Vader still has it in his, spoiler alert, Mustafar castle). Yes, I think about Star Wars a lot more than you do. 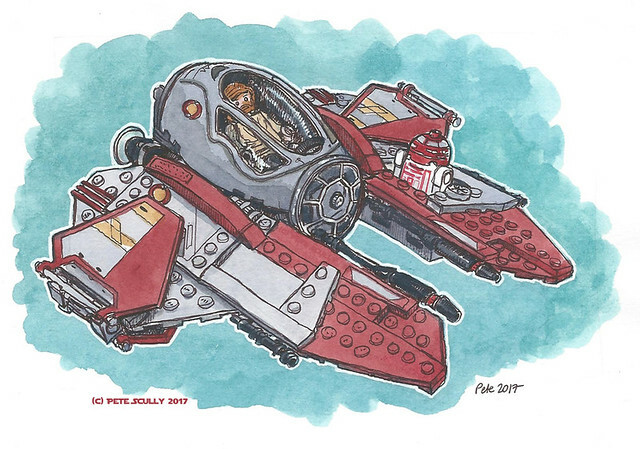 And finally here is another Snowspeeder, the baby brother of the first one, the micro-fighter version. And look, it’s flying in a different direction. 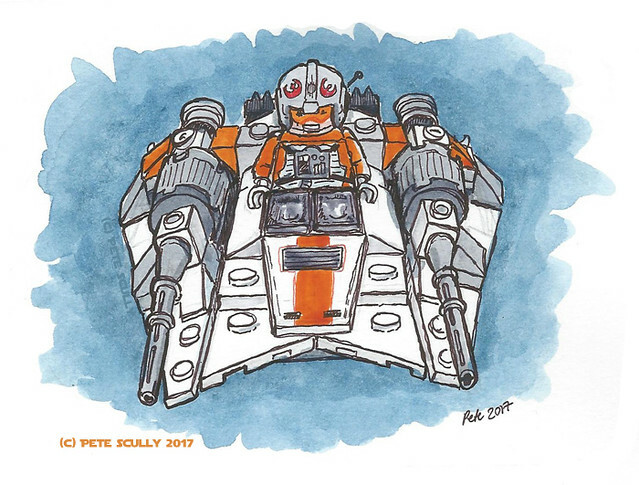 The micro-fighter version is only single-pilot but just as much fun, and with a bit more orange. I love the Rebels, they were great. Listen, I’ve got more of these. 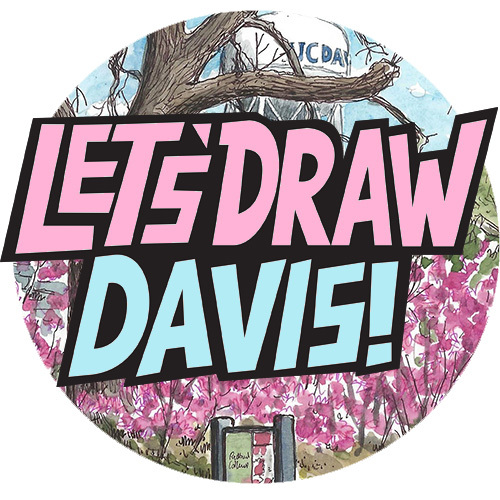 I’ve been sketching like crazy lately, but I’ll post them over two or three blog posts, to spread them out. 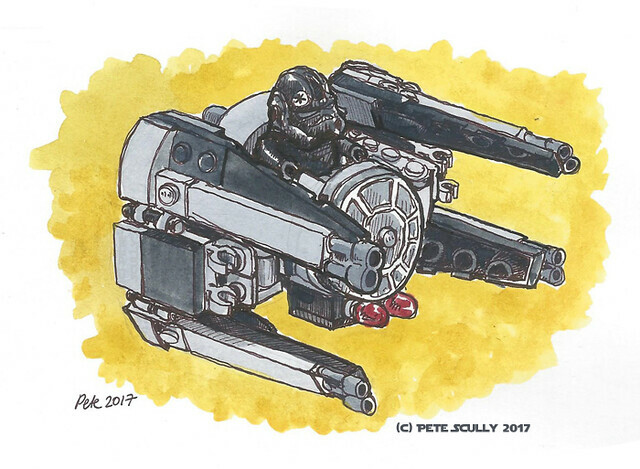 I love sketches, I love Star Wars, and I (well, used to) love Lego! Fantastic series!